Photo courtesy of NYC Media. • Central Park was the first public landscaped park in all of the United States. 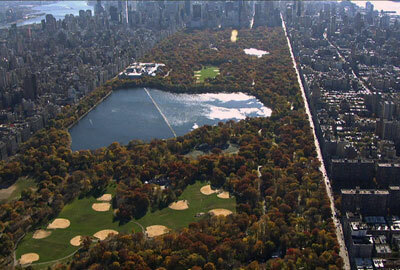 • The Park takes up roughly 843 acres of land, which is roughly 16 billion New York apartments. • The Park is larger than the principality of Monaco. • Since 1908, Central Park has appeared in over 240 feature films, thereby making it the most filmed public park in the world! • In order to create four transverse roads which cut through the park, the construction team used gun powder to blast through 30 feet of solid bedrock. It is said that more gun powder was used in this blasting project than was used in all of the Battle of Gettysburg during the Civil War. • Over 9,000 wooden benches dot the massive park. • 1975 was the last year the New York City Marathon was raced entirely inside Central Park. Learn More: Former NYC Parks & Recreation Commissioner Adrian Benepe shares some of the secrets of Central Park with MetroFocus. • The land which later became the Flushing-Meadows-Corona Park was once referred to as the “Valley of Ashes” by F. Scott Fitzgerald in The Great Gatsby. • Flushing Meadows Corona Park was the first to have a completely accessible playground in the United States. Its “Playground for All Children” opened in 1984. • It was home to both the 1939 and 1964 World’s Fairs. • American Express built a 1 million dollar money tree at the 1964 World’s Fair. It was comprised of more than one million dollars in spendable international currency and American Express Travelers Cheques to symbolize the international economic and cultural forces that unite all nations. • For over 20 years, the park has hosted the Hong Kong Dragon Boat racing competition. home while their headquarters on the East River were being built. One of the most historic events that happened was the establishment of the State of Israel in 1947. 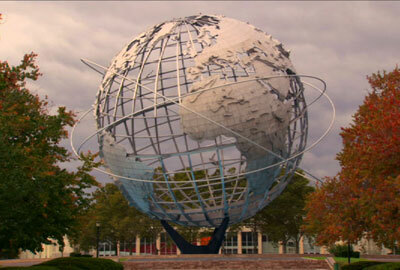 • The Unisphere, the giant globe that was erected for the 1964 World’s Fair, weighs thirty five tons. The globe tilts at a 23 ½ degree angle, which is the exact tilt of the earth. • Prospect Park was designed by the same famous duo that created Manhattan’s Central Park, Frederick Law Olmstead and Calvert Vaux. • There are more than 30,000 trees in Prospect Park; the oldest is 300 years old (Fallen Black Oak on Elephant Hill). • The Long Meadow, which runs nearly a mile, is one of the longest continuous meadows of any urban park in the United States. • The park is home to 50 species of butterflies and 25 species of dragonflies. • The park’s main entrance, the Grand Army Plaza (which has a sculpture of Abraham Lincoln, memorial arch, columns, two pavilions, and nine-feet tall eagles) was created to commemorate the Union victory in the Civil War. • The Prospect Park Bandshell hosted citywide waltz, foxtrot, rumba and jitterbug dance contests in 1944. The winners would receive war bonds. • In the 1960s, there was an entire movement to prevent the Greenbelt area from being converted into highway zones. • More than half of Robert Moses’ highway program that was staked out in The Greenbelt was never built. • On some Greenbelt hiking trails, you can find remnants of highway overpasses. • The park is three times the size of Central Park. The City Concealed: Staten Island Greenbelt from Thirteen.org on Vimeo. • A Naval Training Base operated in Pelham Bay Park from 1917-1918 to prepare troops for World War I. One of the soldiers who trained there was the renowned American actor, Humphrey Bogart. • A Revolutionary War battle took place in Pelham Bay Park on October 18, 1776 known as the Battle of Pell’s Point. There is a plaque that commemorates the victory on Glover’s Rock, which was named for Colonel John Glover who triumphantly led the 843 American soldiers against 4,000 British. 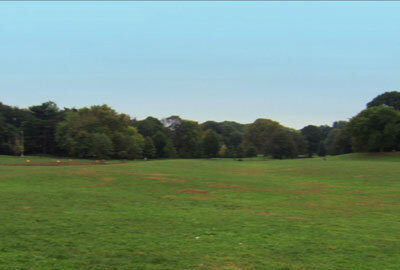 • It is New York City’s largest park property at 2765.5 acres. • After being exiled from the Puritan community in Massachusetts, Ann Hutchinson and her followers established an unsuccessful colony on the land that the park now sits on. They were all killed by the Siwanoy Native Americans who co-occupied the land. • The Meadow consists of 25 acres of switchgrass, sesame grass, and bayberry shrubs just off Orchard Beach. The site is reminiscent of a mid-western prairie and was “created” by accident when topsoil was removed during the 1930s beach construction. Learn More: City of Parks, a local companion piece to Ken Burns’ The National Parks, follows six high school filmmakers as they seek out the often overlooked beauty and history of New York City’s National Parks and Monuments.